Robert Williamson, DDS, born and raised in Glasgow, claims that little about Texas resembles Scotland except for the children, who are much the same no matter where you find them. With a pediatric dental practice limited to infants, children and adolescents, Williamson’s mission is to provide preventive dental care while educating patients (and their parents) about oral hygiene and healthy habits. He advocates starting when children are very young and encouraging a commitment to good health that will last a lifetime. “I enjoy working with kids and the challenge of providing the most comfortable environment possible in which to acquaint them with good dental care,” Williamson said. 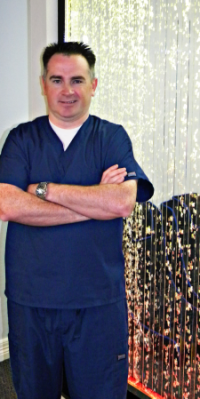 He was trained in, and excels at, the art of safe treatments in a fun atmosphere. Even with parents present (and they are always invited to accompany their children during treatment), there is a peer-to-peer confidence that the environment encourages. “We often extract a tooth and the child doesn’t even know it’s been done!” commented Williamson. Rarely, some children are so anxious that they are unable to become comfortable enough to permit treatment. Williamson’s advanced specialty training qualifies him to administer medicines that help with relaxation, from mild “laughing gas” to oral conscious sedation. The options are important to parents, especially if their children need extensive dental work. Williamson performs most services in his Sherman office, but has privileges at an area hospital if needed. 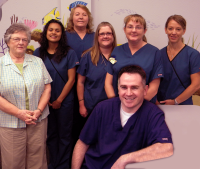 More commonly, Williamson sees children with healthy teeth and gums or with early problems like cavities or gingivitis. He said diet is an important, but often overlooked, component of oral hygiene and suggests that parents eliminate sugary snacks between meals because bacteria can use these foods to stick to the teeth and cause an erosion of tooth enamel. Choosing fruits, vegetables, yogurt, or cheese is a better option if children must snack. Williamson asks parents to help their children brush twice a day. It’s a process that requires persistence and positive reinforcement to get desired results. “Sometimes parents try to let their child do all the brushing at too early an age,” said Williamson. “It depends on the child, of course, but some kids still need assistance until they’re eight or so.” He advocates teaching children how to brush their teeth properly, and then for the first several years, “finishing up” for them to ensure adequate care. Flossing is something some children learn as early as five years of age, but before that, mom or dad need to help. It’s recommended that children use a soft-bristled toothbrush and just a “smear” of toothpaste until their second birthday when they can graduate to a pea-sized drop. That amount should suffice until the child is five years old. Surprisingly, first dental visits are encouraged when the first tooth comes in during infancy. Williamson’s office has a special baby room for the youngest patients. Parent counsel is a significant part of that initial session. Moms and dads are invited to ask questions and share concerns, while Williamson talks with them about their baby’s growth and development, as well as appropriate brushing habits, safety issues, diet, and oral hygiene. The American Academy of Pediatric Dentistry recommends dental checkups twice a year for most children. Benefits include helping the child stay cavity free, reducing the possibility of irritation to the gums, and strengthening the tooth enamel with fluoride treatments. Williamson considers the whole child when assessing oral health. He reviews the child’s medical history with parents and watches for potential orthodontic problems or the possibility that dietary changes could better ensure good overall health. Children are drawn to the “waterfall wall” at Dr. Williamson’s office in Sherman. When a child is familiar with the dentist, it makes it much easier in the event of an emergency. Williamson encourages parents to call him (and he provides his cell phone number to patient families) should a tooth get knocked out. An exam is important, even if the tooth prematurely lost is “just” a baby tooth. Only permanent teeth should be washed and put back in. “Call me!” he stressed. Other situations that could be categorized as emergencies include toothaches, a cut lip or tongue, or broken teeth. Board certified by the American Board of Pediatric Dentistry, Williamson received his undergraduate degree at Brigham Young University before graduating from the University of Texas Dental School in San Antonio. He received specialty training and a Master of Science degree at Ohio State University and trained at Columbus Children’s Hospital for two years. He is a part-time clinical professor at Baylor College of Dentistry. On several occasions, Williamson has provided humanitarian mission service in Mexico, treating children’s dental needs. In October he plans to take his staff to Belize to offer dental care for children at a local orphanage. Going to the dentist can be a positive experience for children and their parents. It’s Williamson’s goal and he’s glad for the opportunity to provide the service to Texoma families.